We love staying at the opal cove It's a friendly and clean hotel Kids love the pool and spa . Had everything you need for a overnight or couple of nights stay. My kids really enjoyed the free foxtel. Nice place, nice location All good, overnight only so not much to report. Clean, warm, comfortable, friendly reception staff. Service in the restaurant was superb and the meal was delicious. Pros - Located close to town. Friendly staff. Clean. Plenty of power points to charge devices. Cons - narrow car park spaces. Website photos dont show a standard Q room, soft bed, small tv, no powerpoints near the small lounge. You get what you pay for - very basic and ok to stay overnight if passing through but otherwise not particularly nice. Quite tired looking despite the term “renovated”. Good accomodation for the price. Suitable for our overnighter in Coffs. Lovely clean hotel, close to the beach Lovely clean hotel, close to the beach. Comfy bed and quiet. Just like smashed avo on toast and binge-watching TV, travel is one of the best things in life. 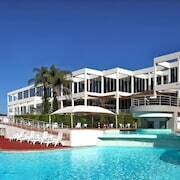 And if your travels take you to Coffs Harbour, you'll find a seriously amazing range of hotels to choose from. Whether you want swanky or simple, you're spoiled for choice here. 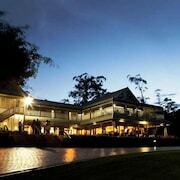 lastminute.com.au has 65 places to crash all within 5 kilometres of Coffs Harbour's centre. To live it up somewhere in the middle of it all, check out the Quality Inn City Centre and the Best Western Parkside Motor Inn. The Best Western Zebra Motel and the Chelsea Motor Inn also have some wonderful facilities. 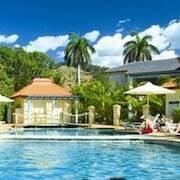 Sapphire Beach, 12 kilometres from the central streets of Coffs Harbour, lists 12 accommodation options. Have a look at the rates and amenities at the Santa Fe Luxury Bed & Breakfast, Aqualuna Beach Resort, Paradise Palms Resort, Sapphire Beach Holiday Park and Reflections Holiday Parks Moonee Beach if you want to base yourself in this handy area. Coffs Harbour Marina is a prominent landmark in the vicinity, and can be easily spied from a distance. Location, location, location! Spend your stay at the Pacific Towers Beach Resort and Pacific Marina Apartments and you won't be far from it. Coffs Jetty Pier is a picturesque place to chill out with the family and appreciate the outdoors. Tradewinds Apartments and Park Beach Resort Motel are two good places to crash if you don't want to stay miles away. Let's be honest, when you're away with your mates you don't need to spend heaps on a roof over your head. 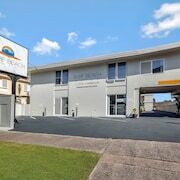 For some disgustingly good-looking rates, check out Hoey Moey Backpackers - Hostel, Bellingen YHA – Belfry Guesthouse and Central Backpackers - Hostel. 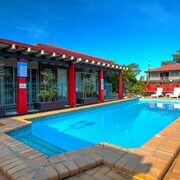 You may also like to stay at the Gateway Lifestyle The Pines, which you'll find 20 kilometres away. 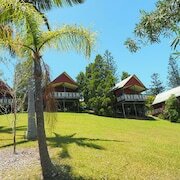 Or perhaps the Bonville Lodge Bed & Breakfast, just a distance of 11 kilometres from Coffs Harbour. 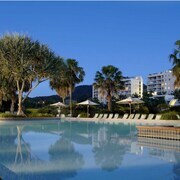 We'd also suggest the BreakFree Aanuka Beach Resort and the Novotel Coffs Harbour Pacific Bay Resort. The first is 4 kilometres from downtown, while the latter is 4 kilometres away. Just can't keep those feet still? If you're nodding in agreement, then go and discover the highlights of the wider North Coast region. Nature lovers should visit Coffs Harbour's gorgeous beaches, coastal plains and rivers. A few other gotta-see sights to put on your hit list are art galleries and craft workshops. Visitors with a serious appetite for adventure can also go hiking, horse riding and four-wheel driving here. Designer jeans or year-round shorts? However you prefer to roll, you're bound to love a trip to Moonee Beach, 12 kilometres away. With the Guru Nanak Sikh Temple and Woolgoolga Creek Falls to check out, you're not gonna be short on things to do. 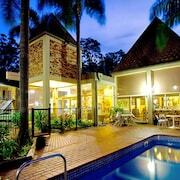 Moonee Beach hotel options are the Emerald Views and Discovery Parks – Emerald Beach. Or, you could consider staying in Emerald Beach, 15 kilometres to the north of Coffs Harbour, where you can pick from the Emerald Apartment and Moonee Beach Executive Retreat. Woolgoolga Beach and the Woolgoolga Golf Course are up there with the most popular places to see when you're in Emerald Beach. Coffs Harbour Airport lies 3 kilometres from the centre of Coffs Harbour. If you're feeling drained after the flight, you'll be over the moon to discover there's some awesome accommodation nearby. The Jetty Focus and the SCU Village are just a short distance away.